59 The Beacon - Thompsons Bay Accommodation. Gorgeous Seaviews and a quick 400m walk onto the Beach sand! Modern 3 B/R Ground Floor unit, wide front lawn for young kids to play or simply sunbathe of the verandah. Sleeps 6. “The Beacon” is a beautifully maintained and secure complex set in spacious indigenous Coastal Forest gardens, just a short stroll onto Thompson’s Bay Beach. You don’t need a car to get to the beach! Thompsons Bay Beach (often referred to as the ‘’Clifton Beach of KZN’’) is a tucked away cove of Beach boasting a pristine 90 metre long Tidal Rock-pool ; 7 day a week Lifeguard Beach protection for bathers; and a unique ”Hole in the Wall’’ rock feature which leads to 2 more cosy and secluded Beach coves. Thompsons Bay is 2 minutes’ drive North of Ballito Bay, and just 15 minutes’ drive from the King Shaka International Airport. 59 THE BEACON is a modern 3 Bedroom Ground Floor unit with a large covered verandah leading onto a wide lawn area – perfect for outdoor Braaing (BBQ) and summer living for families, especially young children, so Braai/ BBQ right out the front door while the kids play or sunbathe on the loungers on the lawn -all while taking in the gorgeous view of the Ocean in front of you. The beach is just a quick stroll away. After a day at the beach cool off enjoy with a crowd of friends for a late afternoon Braai around the inviting Swimming Pool with Braai facilities right there while the kids swim and have more fun after a day in the sun at the beach. 3 bedrooms to Sleep up to 6 adults max. (*An extra mattress can be requested to sleep 1 or 2 young/small children on the floor if required, But this is only suitable for children under 7 due to space constraints). **We also have 2 x Fold-up Baby cots for infants for families with infants. Please enquire to use these when making your booking so they can be set up in advance. The 2nd B/R has a Queen Size bed and The 3rd B/R has 2 x single beds. These 2 rooms share a spacious 2nd Bathroom/shower/toilet. All rooms have large built in cupboards and ample space. The Modern open-plan kitchen is fully equipped with Fridge/freezer, Stove, Microwave, Dishwasher, Washing Machine, Tumble Dryer, Toaster, Kettle, Electric Frying pan; cooler bags & all utensils you need. **Extra note: All the tap water is of high quality and perfectly suitable for drinking. The lounge is spacious with comfy couches; large Flatscreen LED TV incl FULL DSTV/Satellite Bouquet channel selection with hundreds of TV channels (no need to bring your own DSTV card) and a DVD player. The open area patio is covered and leads onto the grassed front lawn facing the Ocean. We have a large outside dining area with table & chairs to seat 8-10 people, large Braai/BBQ on wheels, & a garden sun lounger. Extras available in the apartment are: Beach umbrella, 4 fold-up chairs, 4x Boogie Boards, 2 sets of “flippers”; some kids buckets and spades and nets for playing on the rock pools; 6 x tennis rackets (no balls- please bring your own as these do go missing), Dart Board ( please bring own darts or same reason). **DIGITAL safe in the Main bedroom Cupboard. Our complex is very secure with Boomed-off Security Guard monitored entrance gate & 24 hr Security Patrols. 3 x large Shopping Malls; loads of Restaurants; Take Aways; Laundrette, etc are just a few minutes’ drive away up the hill in the main village of Ballito. 3 different Golf Courses are 5 minutes drive away each. **Smoking is not permitted inside our unit. Smoking is suggested on the verandah/ open areas outside. **Departure time is no later than 10:00am on day of departure for the staff to replace linen and clean. Detail description : The Ballito coastline is known as the ''Dolphin Coast" of South Africa with more Dolphins and Whales sighted year round than any other beachfront zone in South Africa. 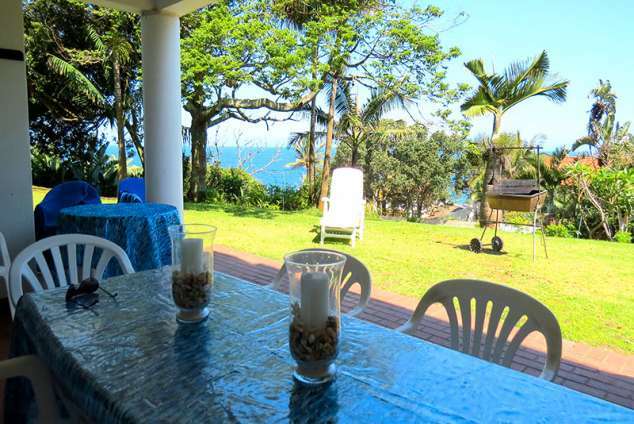 59 The Beacon is situated 300 metres back from the Beach sand , within a secure zone of lush KwaZulu Natal indigenous Coastal Forest gardens boasting wonderful bird life while enjoying Sea views at the same time. The Beacon is also home to a large family of about 60 Banded Mongooses which roam the gardens and often visit the front lawn of our unit, not to mention the troop of indigeneous Monkeys which can seen most days. A Peaceful and tranquil natural setting which is very family oriented..
46123 page views since 02 Jul, 2008. Last updated on 04 Mar, 2019.